NEW YORK, NY--(Marketwire - May 12, 2008) - bnetTV.com, Inc. (www.bnettv.com), a subsidiary of Winmax Trading Group, Inc. (Winmax) (PINKSHEETS: WNMX), is pleased to announce that it has launched their mobile text code campaigns with more than 76 mobile carriers worldwide. This will allow bnetTV to bring to its clients, users, members and other individuals a full and rich engagement of their 'mobile web' presence easily and securely. bnetTV can now charge almost any user, on any mobile network around the world by the easiest means possible -- on a phone bill, credit/debit card or PayPal. bnetTV.com has teamed up with FM World Charities in an effort to raise awareness over skin cancer. This text code campaign allows users to purchase wallpapers and ringtones using their mobile devices with donations going to FM World Charities. To learn more about FM World Charities and this campaign visit http://vc.bnettv.com or www.fmworldcharities.org. Here is how it works: Text GO (space) and a selection of keywords and send the message to 22646. You will receive a reply text message, inside you will find a web link to follow and purchase your selected ringtone or wallpaper. Here is your chance to make a difference and all it takes is just pushing buttons like we all do every day so don't just sit there! Text now! It's as easy as 1-2-3. Here are some examples... Give it a try! wallpaper of the recording artist Paige Wood. USA ONLY, DATA CHARGES MAY APPLY, CONTENT SUITABLE FOR SPRINT AND AT&T DEVICES. Visit http://vc.bnettv.com for more information and get involved today! With approximately 255 million wireless subscribers in the United States and approximately 2.5 billion worldwide, it only makes sense to involve people in this manner. Not only is the mobile device the ultimate in "anywhere, anytime access," making a charitable donation this way ensures that donations reach FM Charities in a timely fashion so the organization can continue to promote Public Health. 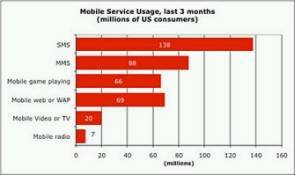 The mobile phone is poised to be the leading media channel for brands and organizations to impact consumers. The Mobile Advertising Report, released by Limbo, earlier this year claimed that over 50% of mobile phone users make use of SMS (Texting) services. The report also showed that marketers should take into consideration age-targeting when running campaigns as over 80% of SMS distribution occurs between the ages of 18-49. Join the FM World Charities community on bnetTV.com. Learn more, engage with others, keep up to date on how you can help. Visit http://vc.bnettv.com and become a member. FM World Charities is comprised of a dedicated group of physicians, celebrities and respected health care professionals who joined together two years ago to help address the needs of a changing world and founded the charity. This not-for-profit organization is devoted to promoting public health and improving the quality of life in under privileged communities throughout the world.